The American grasshopper, Schistocerca americana (Drury), occasionally causes serious damage to crops and ornamental plants, and their great abundance can be a nuisance. 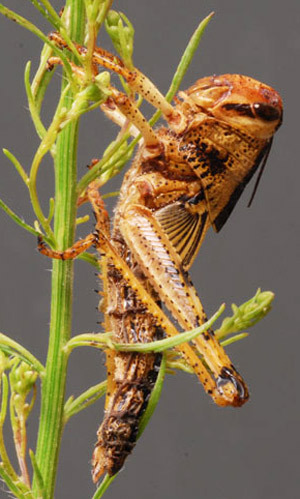 Fields can be invaded daily by the adult grasshoppers, which often roost at night in nearby trees and shrubs. The short-winged nymphs are less mobile of course, and normally reside within sunny fields, as the grasshoppers avoid shade. Their eggs are deposited in the soil. Figure 1. Adult female American grasshopper, Schistocerca americana (Drury). Photograph by Tom Friedel. In North America, the American grasshopper is found east of the Great Plains, throughout the southeast and north to near Iowa and Pennsylvania. It is common throughout Florida, and is also found in Mexico and the Bahamas. Adults: The overall color gradually changes from a pinkish-brown or reddish-brown to more of a yellowish-brown hue as the grasshopper reaches sexual maturity. The adults bear fully developed wings with large dark brown spots on a lighter background. Adults are distinctly different in appearance from the immature stages (nymphs). The length of the male is 39 to 45 mm, whereas the female is 42 to 55 mm long. Figure 2. Adult American grasshopper, Schistocerca americana (Drury). Photograph by John L. Capinera, University of Florida. Eggs: The female American grasshopper deposits her eggs in the soil about 2 to 3 cm below the surface by pushing her ovipositor down into the substrate. The grasshoppers prefer areas with some ground cover to deposit their egg clusters. The egg cluster generally consists of 60 to 80 eggs that are secured together by a frothy polymer-like substance that the female secretes. Females may lay up to three egg pods. The eggs are 7 to 8 mm in length and are light orange in color. Figure 3. Adult female American grassshopper (top), Schistocerca americana (Drury), ovipositing eggs (bottom). Photograph by John L. Capinera, University of Florida. Nymphs: The nymphs hatch three to four weeks after the eggs are deposited and must work their way to the surface. The nymphs go through five or six instars before reaching adulthood. Initially the nymphs remain aggregated in small groups, moving from plant to plant and feeding gregariously. As they grow older they become less aggregated. Figure 4. Aggregation of newly hatched first instars of American grasshopper, Schistocerca americana (Drury), resting on blades of grass. Photograph by John L. Capinera, University of Florida. Six instars are normal, but if grasshopper densities are low only five instars will be completed. If there is a high density of nymphs, the latter instars will be more yellow, orange and black; at low densities, nymphs may be mostly green. Figure 5. Comparison of American grasshopper, Schistocerca americana (Drury), nymphs raised under solitary conditions (green insect) and in a group (orange and black insect). 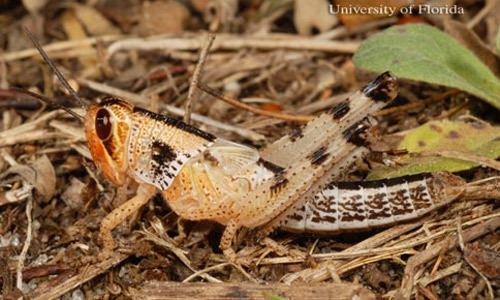 During periods of outbreak, the grasshoppers transition from the green to the orange and black condition. Photograph by John L. Capinera, University of Florida. The developmental stages of the wings (from no wing, to a wing pad, to more developed wing pads, and finally fully formed wings) is the easiest identifier for determining the instars. The first instars are pale green with a black mid-dorsal stripe running the length of the body. The first instar is 6 to 9 mm in length and has 13 antennal segments. Wing pads appear in the second instar as well as the addition of four more antennal segments; this instar is usually 12 to 16 mm long. Figure 6. First instar nymph of the American grasshopper, Schistocerca americana (Drury). Photograph by Lyle J. Buss, University of Florida. Figure 7. Second instar nymph of the American grasshopper, Schistocerca Americana (Drury). Photograph by Lyle J. Buss, University of Florida. The third instars are 16 to 20 mm long, have 21 to 22 antennal segments and wing pads with a triangular shape. Figure 8. Third instar nymph of the American grasshopper, Schistocerca americana (Drury). Photograph by Lyle J. Buss, University of Florida. In the fourth instar, which is 20 to 26 mm long, wing venation becomes present in the wing pads and the antennae have 22 to 24 segments. Figure 9. Fourth instar nymph of the American grasshopper, Schistocerca americana (Drury). Photograph by Lyle J. Buss, University of Florida. In the fifth instar the orientation of the wing pads changes from ventral to posterior. This means that the wings now point horizontally, instead of vertically, toward the ground. The fifth instar has a length of 27 to 35 mm and 24 to 25 antennal segments. Figure 10. Fifth instar nymph of the American grasshopper, Schistocerca americana (Drury). Photograph by Lyle J. Buss, University of Florida. The sixth instar is 32 to 45 mm in length and has 25 to 26 antennal segments. The wings extend back to cover several abdominal segments. Figure 11. Sixth instar nymph of the American grasshopper, Schistocerca americana (Drury). Photograph by Lyle J. Buss, University of Florida. The American grasshopper has two generations per year. It overwinters in the adult stage, unlike most grasshoppers, which pass the winter in the egg stage. 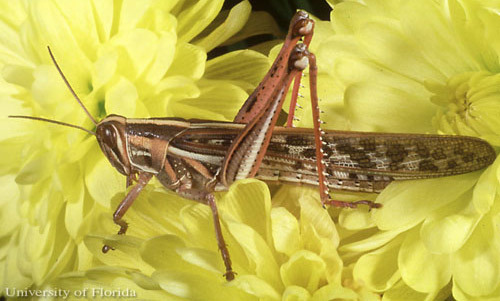 Thus, American grasshoppers are present throughout the year in Florida. The principal hatching periods are from February to May, and again from August to September, but the generations may overlap. 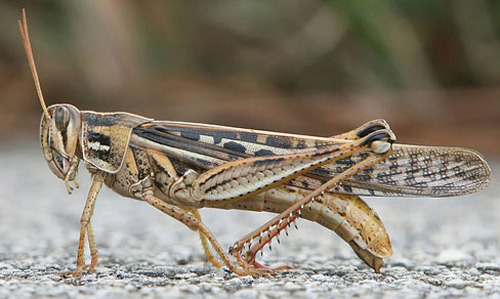 The American grasshopper can cause injury to citrus, corn, cotton, oats, peanuts, rye, sugarcane, tobacco and vegetables. This species receives attention in Florida due to its defoliation of young citrus trees. 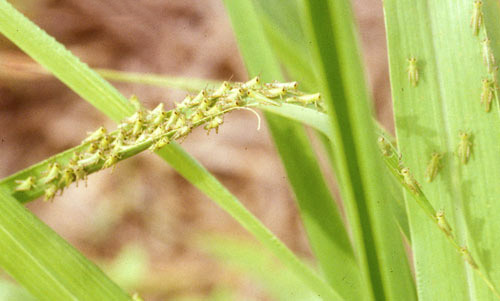 The plants are damaged by the grasshopper gnawing on the leaves, and young vegetable plants can be eaten to the ground. 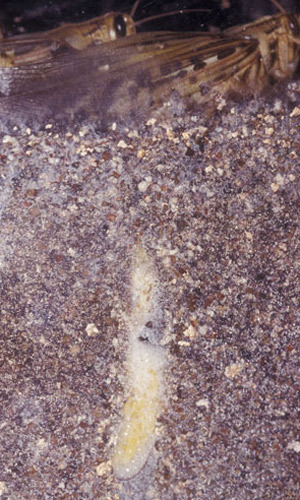 Most of the feeding damage is caused by the third, fourth, and fifth instars. Those three stages have a much larger appetite than the adults. 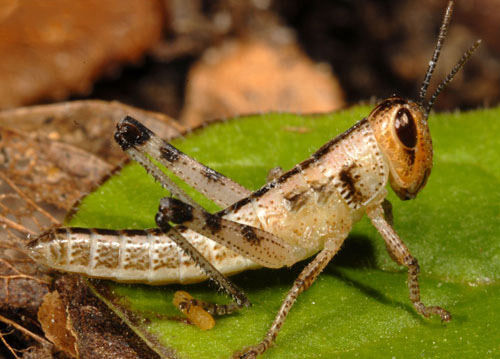 Aside from commercial crops, the American grasshopper also shows a preference for several species of grasses: bahiagrass, bermudagrass, crabgrass, nutgrass and woodsgrass. It also feeds on dogwood, hickory and palm trees. Figure 12. Feeding damage to a young citrus tree caused by the American grasshopper, Schistocerca americana (Drury). Photograph by John L. Capinera, University of Florida. Figure 13. 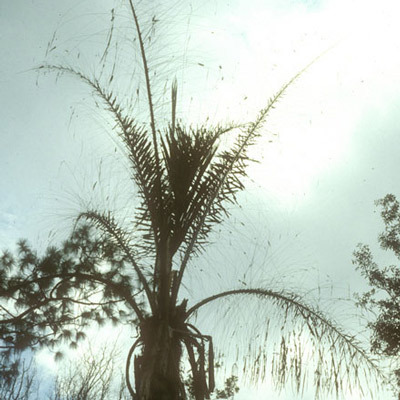 Fronds on palm tree almost completely defoliated by American grasshopper, Schistocerca americana (Drury), during grasshopper outbreak in Dade City, Florida. Photograph by John L. Capinera, University of Florida. Figure 14. Partial defoliation of foliage along edge of corn field, in Gilchrist County, FL. Damage by the American grasshopper, Schistocerca americana (Drury), tends to be concentrated along field margins, at least initially. Photograph byJohn L. Capinera, University of Florida. Significant damage to plants occurs when these insects become very abundant. Abundance commonly an increase in favored foods, typically weedy grasses. This can result from weather that favors grasses such as mild winters, increased rainfall, suppression of grazing by livestock, or soil tillage. For example, if fields are not tilled after crop harvest or grasses are allowed to grow luxuriously in young pine plantations, weedy plant populations can develop that favor grasshopper survival and abundance. 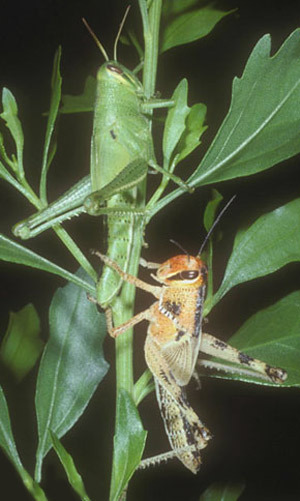 Short or sparse vegetation allows predators to detect and feed on grasshoppers, a favorite food of bird life. Figure 15. 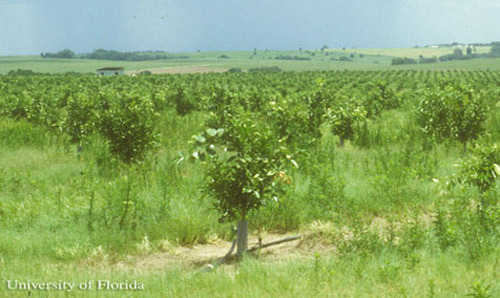 Young citrus grove lacking good weed control practices in Lake County, Florida. The weedy growth shown here is conducive to grasshopper population growth. Mowing would help alleviate this problem. Photograph by John L. Capinera, University of Florida. Grasshoppers maintain optimal temperature by climbing up and down vegetation, and by moving to more exposed (sunny) or less exposed (shady) locations. When they are abundant they may climb up screen enclosures around pools, and up the sides of houses. Here they nibble their surroundings, and because their mouthparts (mandibles) are sharp, they can make holes in the fiberglass screening. This can be quite expensive to replace. The greatest level of damage is caused by last instar nymphs and young adults. This corresponds to the overall greater level of activity of these stages. Figure 16. 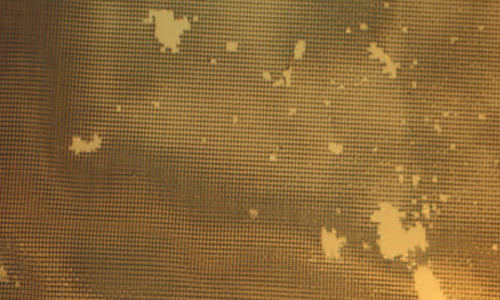 Window screen damaged by nibbling of American grasshoppers, Schistocerca americana (Drury). Photograph by John L. Capinera, University of Florida. Sampling. Grasshopper densities may be estimated using two methods. The first is to select a plot and determine area. The area can then be walked and the number of grasshoppers that leap or fly can be counted. This provides an estimate of number per unit of area, and when the numbers of late instar nymphs or adults exceed about 15 per square yard, there is potential for damage. The second method is to sweep the plot area with a sweep net to determine the average number of grasshoppers per sweep. The latter technique is a relative assessment that is only useful for distinguishing "high" from "low" density areas. Biological control. 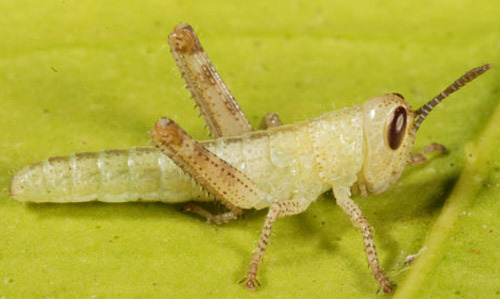 The only biological controls known for the American grasshopper affect the population on a small scale. The larvae of flies (Diptera: Sarcophagidae and Tachnidae) have been found to parasitize grasshoppers. Blister beetle (Coleoptera: Meloidae) and bee fly (Diptera: Bombyliidae) larvae, which live in the soil, will consume grasshopper eggs. Grasshoppers also fall prey to a number of birds. Cattle egrets consume large numbers and to a lesser extent so do robins, mockingbirds and crows. Cattle egrets commonly are seen in association with cattle and horses, and are quick to feed on grasshoppers disturbed by the feeding of these large animals. 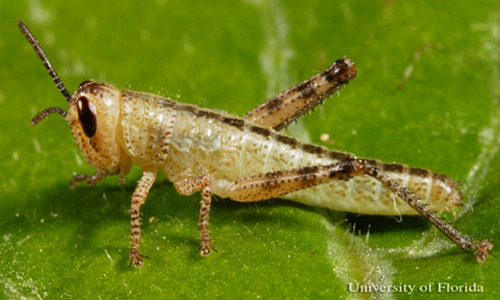 One natural enemy that can be quite effective locally is the fungus Entomophaga grylli. Entomophaga grylli invokes a general condition called 'summit disease'. The name is derived from the fact that infected individuals climb to an elevated location (summit) where they die. This elevated location helps the pathogen to spread because it is more likely to drip or blow onto foliage below, where it can be contacted by healthy individuals as they feed on foliage. Entomophaga grylli is not evident because the spores develop inside the body of the grasshopper. However, the dead grasshopper eventually disintergrates, allowing the fungal spores to be dispersed. 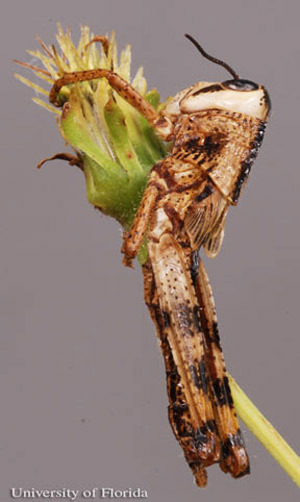 The principal evidence of infection of E. grylli is the peculiar behavior of the dying and dead grasshoppers: they grasp vegetation tightly with their legs, even when dead, and die in an elevated location, with head pointing upward. Figure 17. Immature nymph of the American grasshopper, Schistocerca americana (Drury), killed by the fungus Entomophaga grylli. Photograph by John L. Capinera, University of Florida. Figure 18. Immature nymph of the American grasshopper, Schistocerca americana (Drury), killed by the fungus Entomophaga grylli. Photograph by John L. Capinera, University of Florida. Cultural control. 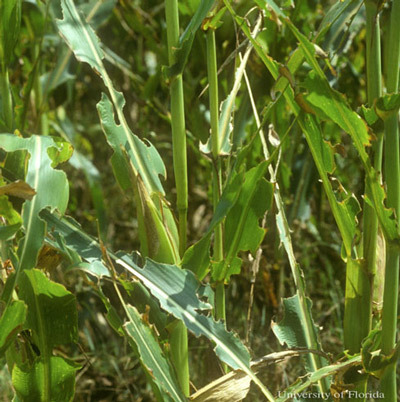 Weeds are a major problem, encouraging high populations of grasshoppers. Disking and plowing are two good ways to destroy grasshopper eggs and this also kills small nymphs. In citrus groves, clean cultivation acts as a deterrent to oviposition and reduces the number of newly hatched nymphs. The time of cultivation is very important. 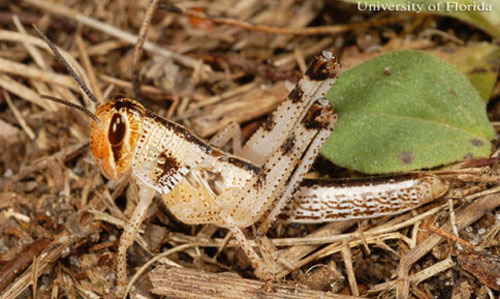 If cultivation is too late, the grasshoppers may actually be driven to the crops for a source of food. 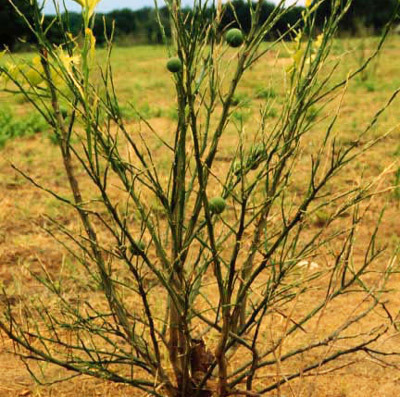 In Florida, young pine plantations in which weed control is not practiced have yielded high levels of grasshoppers. These grasshoppers have been known to affect crop plants that are near the boundaries of the pine farms. A continuous weed suppression program, resulting from tillage, application of herbicides, or mowing can help avoid this problem. Capinera JL. 1993. Differentiation of nymphal instars in Schistocerca americana (Orthoptera: Acrididae). Florida Entomologist 76: 176-179. Capinera JL. 1993. Host-plant selection by Schistocerca americana (Orthoptera: Acrididae). Environmental Entomology 22: 127-133. Capinera JL, Scott RD, Walker TJ. 2004. Grasshoppers, katydids, and crickets of the United States. Cornell University Press, Ithaca, NY. 249 pp. Dakin ME, Hays KL. 1970. A synopsis of Orthoptera (Sensu Lato) of Alabama. Auburn University Agricultural Experiment Station Bulletin 404. Griffiths JT, Thompson WL. 1952. Grasshoppers in citrus groves. University of Florida Agricultural Experiment Station Bulletin 496: 1-26. Kuitert LC, Connin RV. 1952. 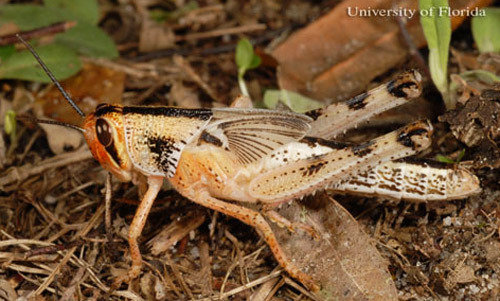 Biology of the American grasshopper in the southeastern United States. Florida Entomologist 35: 22-33. Kuitert LC, Connin RV. 1953. Grasshoppers and their control. University of Florida Agricultural Experiment Station Bulletin 516. Milne L, Milne M. 1995. National Audubon Society Field Guide to North American Insects & Spiders. Alfred A. Knopf, Inc. New York. pp. 425-426. Thomas MC. 1991. The American grasshopper, Schistocerca americana americana (Drury) (Orthoptera: Acrididae). FDACS - Division of Plant Industry Entomology Circular 342. Publication Date: September 1996. Latest revision: December 2014.